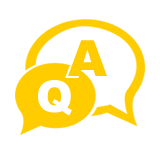 All Topics > Title Transfer > How Can I Add My Daughter to My Vehicle Title? My daughter will soon turn seventeen and I'd like to add her on my vehicle's registration and title so she has legal rights to it and so I can add her to my insurance policy. What is the process for doing so? Is it complicated? Thank you for your time. The process of adding your daughter's name to your vehicle's title is as simple as processing a title transfer (such as when buying a vehicle), except that you, the current owner will act as both a seller and a buyer in terms of the signatures required on the title. The process will involve preparing your current title as if you were selling the vehicle to your daughter, with the addition of listing yourself as a buyer as well. So in other words, on the back of the title, where you write in the buyer(s) information, you will write in both your information and your daughter's. Then, both of you will sign your names as the new current owners. That's it. Once your paperwork is in order, you'll submit it to the DMV, and they'll mail you a new title with both your names on it in 3-4 weeks. In the interim, you'll be issued a new registration card indicating both of you as current owners. As mentioned, adding your daughter's name to your vehicle title in California is fairly simply and straightforward, and the fee for doing so is pretty low ($15.00 at the time of this post). The process is almost the same as transferring your title to a new party, similar to that of selling your vehicle to someone other than a family member, except no smog inspection will be required and no Use Tax will be collected. Typically during a title transfer, 4 year and older vehicles require a smog check, and Use Tax is collected based on purchase price. In this particular case, your transaction will be exempt from both of these requirements. For one, the vehicle isn't being sold, so there are no taxes to pay, and second, the vehicle is staying in the household, so no new smog inspection is needed. Great news, right? To get the process started you'll need to have prepared two documents; the vehicle's California Certificate of Title (which you more then likely already have) and a Statement of Facts form (REG 256) (which you may download here). Complete the title by filling in the buyer information as yourself and your daughter. If the vehicle has a lien holder, you'll need to contact them first and obtain rewritten authorization. All parties listed on a car title are responsible for the bank loan. Typically lien holders have no problem adding a family member. If you don't have the vehicle's certificate of title or have lost it, you may download and complete a REG 227 (Application for Duplicate Title), and use it in lieu of the missing title. 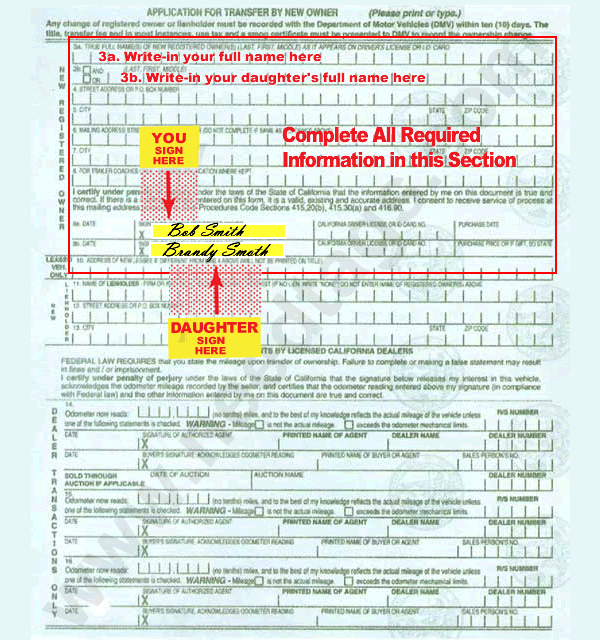 Both you and your daughter will need to complete and sign the REG 227 just as you would an original vehicle title. Assuming you have your vehicle's title in hand, begin by signing the front of the title on Line A. This releases interest/ownership of the vehicle to the parties(s) named on the back of the title, which you'll be filling in. Next, complete the odometer information section on the front lower portion of the title, and sign as both the seller and buyer. Your daughter's signature is not required here. Note, the odometer section does not need to be filled-in if your vehicle is 10 years or older. Complete the reverse side of the title with the new owners information; which will be yourself and your daughter. Ensure you both sign as registered owners. Make sure you pick the correct check box where it asks for an AND or OR for the registered owners names. If you check OR, either of you may sell the vehicle at any time without the other's signature/consent. If you choose AND, both you and your daughter must sign the title when selling the vehicle in order to release interest/ownership. Next, you'll need to download and complete a REG 256 (Statement of Facts). The requirement of this document is really what sets the "title transfer" apart from an ordinary transfer. 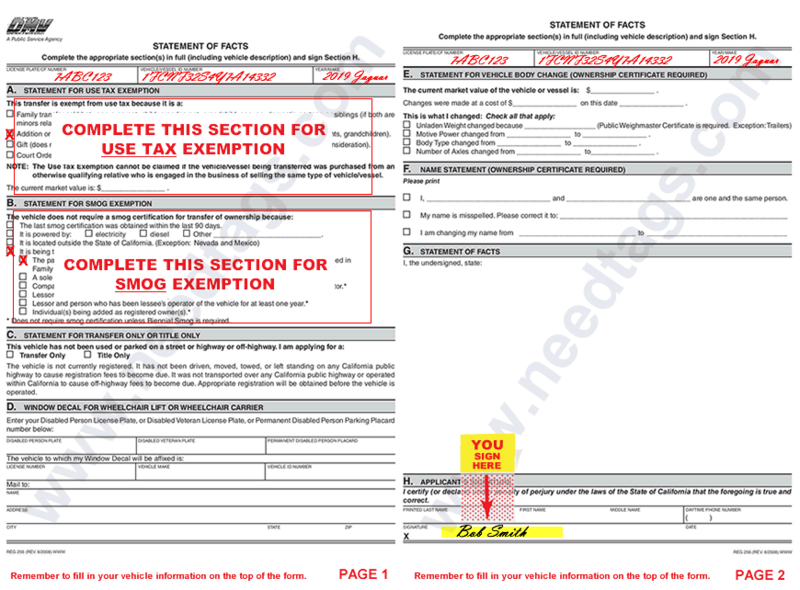 You'll need a REG 256 in order to claim smog check exemption and not pay California Use Tax. Complete section A of the Statement of Facts form (Use Tax Exemption), marking the Addition or Deletion of Family Member box. Next, complete section B of the Statement of Facts (Smog Check Exemption), marking the transfer is occurring between family members. Sign page two of the REG 256. In this particular case, you (the current owner) must sign the REG 256 because you are requesting a title transfer for the purpose of adding your daughter as an owner. Ensure you write in your vehicle's license plate, vehicle identification number (VIN) and year/make on the top of both pages one (1) and two (2) of the REG 256. You're all done with getting your paperwork in order. Now it's time to get your paperwork processed. You'll need to turn in your old Certificate of Title for a new one which will include your name and your daughter's name. You have two options to complete this transaction. Once you're done your new Certificate of Title will be mailed to you by the California Department of Motor Vehicles. Expect to receive your new title in around 3-4 weeks. 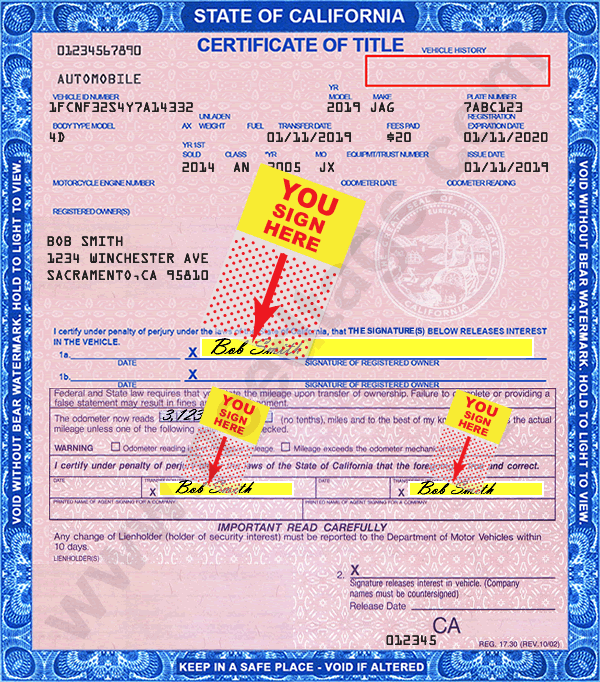 For security reasons, all new Certificate of Titles are mailed out from Sacramento. DMV field offices can not issue new titles directly. Simply upload a copy of your documents (Certificate of Title and REG 256), mail-in your originals, and you're done. No need to visit the DMV and wait in long lines. NeedTags can process title name additions for all types of vehicles including motorcycles, boats, RVs, ATVs and trailers. Option 2. In Person - You may turn in your documents either at a State of California DMV branch office or a privately owned local DMV service provider and pay fees there. Visiting a local DMV service provider is a fast way to make changes to your vehicle title (addition or deletion of title owners). These businesses are authorized by the California DMV to provide a full-range of DMV registration services quickly in-house. DMV service providers charge a nominal fee for their service, but often have little or no wait and can save you plenty of time. How To Proceed Transfer of Gifted Car with No Title? 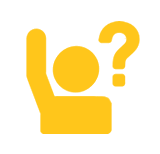 Can I Sell My Vehicle Without a Title or Pink Slip?